When I moved back to Ohio after teaching in Virginia, I noticed something right away that was a popular feature in all classrooms. I wasn’t familiar with these but I easily jumped on the bandwagon. I made the letters “I Can” out of construction paper and laminated them, I stuck them on my front board, and for each lesson I finished the statement with whichever standard I was focusing on: I can analyze in detail how a key individual, event or idea is introduced, illustrated, and elaborated in a text (e.g. through examples and anecdotes). It didn’t take long for me to realize, however, that writing something on a board does not mean it is accomplishing anything, despite whatever cute colors, laminated letters or wiggly writing you use. 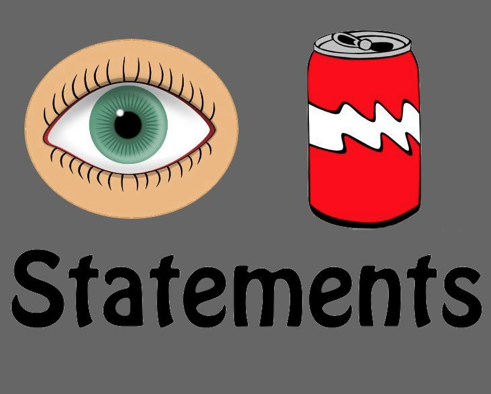 I began making a point to mention the “I Can” statements. I would read them aloud to the class, I would try to refer to them throughout the lesson, I would end my lessons by going over them. But I realized the problem wasn’t so much how I was introducing them to my students, but what I was introducing. Read again this sixth grade standard: “I can analyze in detail how a key individual, event or idea is introduced, illustrated, and elaborated in a text (e.g. through examples and anecdotes).” Not the easiest idea for 11-year-olds to comprehend. I couldn’t blame my students for letting that jumble of words go in one ear and out the other – I was the teacher and I was still having trouble breaking down exactly what the standard was saying. In an effort to have standards written in student (and teacher) friendly language, I set about to rewrite each standard for each grade I teach (6th, 7th and 8th). While I was doing this, I decided to take it one step further. I wanted to create a sense of ownership between my students and the standards, so I turned this streamlined version into a checklist. At the start of each school year, I give students a packet with all of the standards and “I Can” statements. 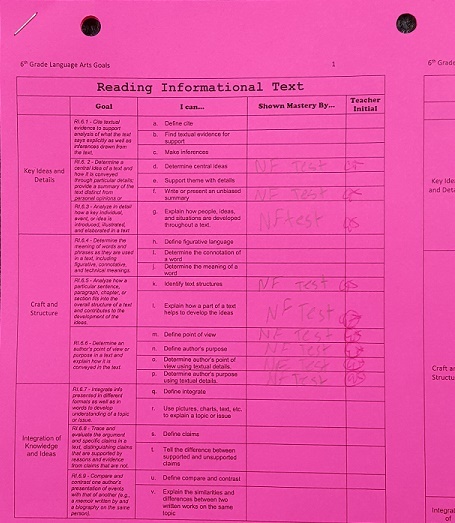 Each time we take a quiz or test over a standard, the students who get 80% or higher write the initials of the assignment (SET = Story Element Test) in the “Shown Mastery By” box. I come around and give my initials of approval. As an incentive, I offer candy each time a student earns 5 initials per page. To buy the entire six-page packet I created instead of rewriting the standards yourself, check out my Teachers Pay Teachers store!